We’ve all seen them in the front of various grocery stores, mall entrances, and the occasional street corner- men and women ringing a bell and wearing red aprons with a big red kettle in front of them. They want you to donate money for charity. It’s typically done around Christmas time. I’ve heard this a lot. I’ve also heard how people are reluctant to donate because they aren’t sure where the money is going. I can completely understand why they would feel that way. Religious organizations in general haven’t exactly had the most sterling reputation over the last few years. With priests and pastors being charged with sexual misconduct left right and center, sometimes even, horribly, involving minors; accusations of corruption and money donated in good faith being used for nefarious purposes; snake oil salesman on TV using God as a way of selling fake miracles and conning innocent, struggling people out of their money- trust me, I understand the skepticism, if not outright cynicism. I’m not going to address religion here. What I am going to do is address the Salvation Army, their bell-ringing campaign, and tell you exactly where that money goes after you stick it in that kettle, and what it is used for. I worked as a Youth and Program Director for the Salvation Army Corps in Belleville, IL for three years. I’m currently working seasonally as their Kettle Coordinator- which basically means I help run that Corps’ bell-ringing campaign through Christmas Eve. Full disclosure- I was and am an employee, but I’m not a “Salvationist”. I don’t belong to their church as a soldier. I haven’t always agreed with everything that they say, or how they do things all the time. Show me an employee that has ever fully agreed with their employers. That said, being that this is my 4th season helping to run a bell-ringing campaign, and having been involved in the financial planning sessions for our Corps and being privy to where the money we raise each year goes, I do have intimate knowledge as to how things generally work, and I wanted to drop a little of that knowledge on you fine folks so that you can be well informed in your charitable giving decisions. Bell-ringing typically starts around the 1st of November and typically ends on Christmas Eve. That schedule can differ slightly from Corps to Corps and territory to territory, but that is a general ballpark time frame. So we have roughly two months to ring bells and try to raise money. Some chain stores have an agreement already with the Salvation Army, so the Corps in those areas already have sites that they can ring at automatically, but the rest of the sites have to be recruited by the Captains of the Corps in that area. The more sites you have to give you permission to ring, the more potential money you can make. It’s also more sites that you have to man with workers, more expenses in gas, transportation & wages, and more time. 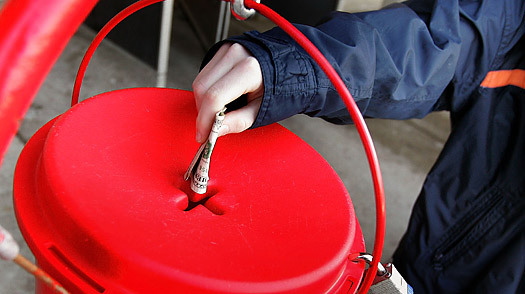 The money raised during the Kettle Campaign each year accounts for roughly 60-70% of each Corps budget for the year. Again, that number can differ from Corps to Corps, but for a ballpark generalization, it’s not a bad one. So just to reiterate: 2 months to raise money for roughly 60-70% of a yearly budget. The Corps in Belleville is also a community center. They offer a hot meal three times a week to anyone who comes- the “SAL Cafe”. They offer an after school program for local community kids that provides homework help, tutoring, and recreation for the kids until their parents get off of work. The offer rental assistance, utility assistance, and run a food pantry for those in the community that need help (when they have the funding to do so). During the holidays they provide food baskets to those that may be without, and toys for children whose parents couldn’t afford to have Christmas for their kids. They do all this without charging the people that they service a dime. The Salvation Army does receive grants and funding from various sources to help with some programs that they offer- such as the utility assistance and the food pantry. However, the cost of running the community center, the salaries of the paid staff, the electric bills, maintenance, etc. is all mostly paid for by the money raised during Kettle Season. Disaster relief, such as what is going on right now in the Northeast after Sandy, is all at least partially funded by the money that the various Corps raise during the Kettle Season. Everything that the Salvation Army does throughout the year is, at least in some part, funded by the money that is donated to them during these last two months of the year, every year. So rest assured that if/when you do decide to drop some money into those shiny red buckets that that money is going to a good cause, and not to line the pockets of a select few. It’s going towards the individual Corps in that area so that they can continue to provide the types of services to the community that I’ve outlined in brief detail above, and towards the disaster relief that takes place when things like the “Superstorm” hits residential areas around the world. It is going towards a good cause, regardless of how you may feel about religion in general or the Salvation Army’s beliefs in particular. So think about that the next time you hear that annoying ringing sound when you’re out shopping. Think about the lives you may touch, even in small ways, by dropping some change or a few bucks you happen to have on you into that bucket. In some cases that could mean the difference between literal life and death for someone. I know, because I’ve seen it myself. Make a difference this season in whatever ways you can. You’ll be glad that you did.